John: You know, I sure dream different now that I’m back down to Vegas. I don’t know what the deal is. I guess there’s a lot to the various influences that must be archetypal from area to area. Ann: Yeah, I was curious, very curious about that particular question. I was going to ask that question. How has the dreamworld shifted now? John: I guess one’s influenced by everything in their atmosphere and when you have a change from one area in which maybe there’s kind of an essential motif and vibration that exists there, to another in which the energetic or the vibration is different, and whether it’s based on weather or the chemistry of whether it’s an earth, or water, or fire or air area. I guess that all plays into it but the effect of things that occurs over time creates an imprint that you take in and you take it in energetically, and it’s the energetic that you’re identified with. In fact, what was surprising to me that came in last night that I’m actually embarrassed about it because I talked about the energetics and whatnot but I’m always used to taking, like for example looking at a dream and if a dream has a house in it I see that as a home or a significance to going to something that’s more of a rooted aspect of your nature, and going through doors seems to be important, and a car is like journeying and traveling towards part of yourself. All of those little aspects if you think about them all have kind of an image or a symbolism that you can see as having an outer context, but what I got confronted with last night was this idea that we are… there’s nothing that we’re not, but the thing that that applies to is the energy. It doesn’t apply to the physical aspects of things. In other words, it’s like you can’t learn anything if you don’t already have a component of that part of your nature already, and on an energetic level that’s what makes everything go. Otherwise, it’s all dead, it’s all lifeless. What is alive, what is vibrant about something is this energetic that’s imbedded in it and that energetic is… you’re shaped, you’re formed, you’re created out of that energetic, you are that energetic, and so that’s how you’re able to come to know distinctions and differences. If for example you go to a new area and there’s something completely peculiar or different in that area going on you don’t really sort it out by saying well, I guess it’s human nature to try to sort it out by saying well, it’s because the climate is different or something. Actually, the better way is to recognize, it really gets down to this basic thing that it’s the energy that’s different. Now, there could be outer events that you could try to associate with that and the problem with doing that is you’re inclined to then think that it has something to do with those outer events. But it is the energetic. The energetic may be quickened, based upon the way something is composited differently in different locales, where it makes it more dormant in one area versus in another area. Like for example the teacher was doing something in Boulder… He had a program there and he was doing something different in Boulder and someone called him on it saying, you know, acting as if he was doing something on an energetic level. They noticed it, and they were surprised. And he said, “Well, everybody has got to do something,” but then in the course of explaining it he said, “It’s easier to do it in an environment where there is the thoughts, the mental thoughts and the mannerisms that exist in the area don’t conflict with the enfoldment. In other words, to try to bring it through in New York City would be much more difficult, but the impression that was cast was by making it happen or bringing it through in Boulder, you brought it through into manifestation so that it could then permeate out and have an effect in, say New York City, but it was better to do it where it had the easiest way of coming through. And so I guess that’s what I’m having to look at only by backing up, taking a step back, and looking at how what it is that I pick up or I denote is all energetic, and that whatever it is that I see as the outer, we’ll say, chemistry of things that have correlation to one’s senses or an appeal in that regard, that that is just all mindful stuff. That’s stuff where… Well, too great of an indulgence in that area can tend to confuse or veil you to the only real way that you use to sift something out and that’s an energetic system. And so when you see bizarre things happening, the tendency is to conclude that the bizarre thing is bizarre because it has outer judgments to it. Like for example in this building there was a party and one of the guys that has quite a bit of influence in this area had rented the big area that you could have like 100-150 people in and I don’t know how many he had there but you are supposed to, the rules are that you are supposed to exit that area, you know it’s over at midnight. Well, he was kind of a person of influence, so he ignored that and, at 12:30am the person above that must have been able to hear a little bit of the noise, called down at the desk and informed them that they thought that place should be shut down. It shouldn’t be operating, you know it’s after midnight. The front desk there, the people on staff being a little bit foolish, instead of enforcing this against this guy, went up and kind of told him what had happened. And so then this guy, he comes down and goes over to the party like at 1:30am and he says, “Could you just turn everything down a little bit?” He’s not saying that they have to kill the party. This is a guy that’s fabulously wealthy. I mean, you would think he would have more sense to not do what he did but he goes catatonic and he hauls off and he hits this guy and then some guests pounce on him and they practically kill him. They put him in the hospital. John: And so you sit there and from the surface you can judge this in an outward way. You can say well, he looks like kind of a bully and then there are stories like well, he has attorneys, like 34 different attorneys so he pushes his way around and gets whatever he wants because he uses the might of his wealth to… One guy was telling me that he’ll spend $20,000 to get a $5,000 victory because it’s just all about winning you know. All of these kind of statements are kind of energetic, but more outward in their judgment. But then I started to ponder this. I guess I didn’t intend to ponder it, it came to me in my sleep. I suddenly saw that the reason why he did what he did was because he was objecting to some of the other kinds of favoritism that he saw in here by others who are similarly situated. This is a building that has the influence of one guy who built the tallest building in the world, I think it’s Singapore or something, and the other one is responsible for the best casino in the area. And this whole thing is put together in a complex that is over-the-top, and then this building is run by these people that do this over-the-top stuff. And they don’t necessarily properly relate to the average person. In other words, they see themselves differently. You don’t really think of it like that but there is kind of a type of caste mentality in that real upper echelon of wealth. And this guy gets that, but he’s not part of that group. He just happens to be here, but he’s not part of what made this happen and the other developments around it. But his nature is similar and so he is inclined to think that he’s entitled to certain special favors. Like for example, he thought that he should be able to be taken to the airport by the valets whenever he wanted to go to the airport, and of course then that leaves nobody around perhaps when someone needs groceries brought up or something else, and that increases the expense because then you have to have another valet or two because he can’t just do this in a favoritism thing, which is how it had been for some time, and then that blew up because we’re all here. You cannot have certain people that are better than others. Well, he hasn’t really kind of shaken that. He kind of feels certain entitlements. Well, when you feel these certain entitlements where it’s based upon looking around and seeing how others are commanding it or demanding it for themselves, and somehow or another you’re not getting it, you tend to go a little catatonic inside – energetically – especially if you have personal attachments – in other words where you do not have a certain consciousness to know better. A certain linkage to hearing the heart in a particular way, and so it doesn’t help when the staff leaks out to him that maybe there are some complaints, maybe he should keep the music down, and he’s sitting there drinking and he roughs that into the overall motif that this is baloney, it’s his turn now. And then this guy comes up and this guy is actually a nephew to another person on the board that’s part of the system that runs things here, and he just flips out, he just hauls out and knocks this guy’s… in fact, he’s so righteous in his thing, and drunk, that when they finally get security and whatnot to bear here, the first thing out of his mouth is he may have hurt his fist. So if you didn’t go backwards on the energetic, you wouldn’t realize where he was coming from, and then if you go back and see where he’s coming from, if you can screen out certain things, you can actually see that what he did has some common sense to it – from his perspective, not the perspective of everyone else necessarily, but from his perspective of a certain type of personal self-aggrandized entitlement. And when you see that then it can make sense. Otherwise, you just say well, we need to throw a bit, we need to do this, I mean he’s a bully and on and on and on you go and you take a black-and-white approach. There is another one in here just to give you another example of how peculiar things can be. She’s a woman that’s related to the system and, therefore, she was always raised with a golden spoon in her mouth so she never really saw the real world, so to speak. And so I just happened to be ambivalently getting into the parking garage, which is a level below, and I must have hit the elevator button a split second before she hit it on the first floor where the elevator kind of is cued to park, and so it is supposed to go up when she pushes the button to her floor. And it goes down, and with no hesitation at all she jumps on the intercom of the elevator and complains to the desk that this elevator is malfunctioning. So I am getting on the elevator as she’s finishing up this conversation and gotten it re-keyed so it cooperates. I push my floor, which is 9, and she has got her floor pushed, which is 10, and she turns to me and she says, “I suppose you want to go to 9.” I did not know what the heck she was saying. That’s a dumb remark, right? Well, the elevator did not go to 9 did it? It went to 10. She had it re-keyed. Then it came back to 9 later after she got off. This is an energetic bizarreness in terms of how it is that the world comes through from her perspective. Ann: Very interesting isn’t it? John: It’s interesting to note that you can see everything from the energetic. You don’t see it from… If you see everything from the detail of the circumstances, it can be humorous and funny, but you do not quite get it. But if you see everything from the energetic, you can actually understand why it is that a person acted like that to a certain degree. You can get a sense of what is missing in terms of a certain energetic flow, or impression, that didn’t somehow or another get set up, or got veiled in terms of what was needed to come across. Now, as I was dreaming this Jeane’s dream was also on the energetic schematic but what she was dreaming was that it was a shift. In other words, she saw the place and then you shifted and this is really where you belonged. And I was shocked. That’s exactly right. And so I had a dream that I just couldn’t understand and couldn’t understand, which is rare. You know, because I’m pressed in a different way down here and the initial take of it is I’m falling behind, I’m not keeping up. I’m even been chastised to a certain degree and then I realize it is all because one needs to make this very slight distinction between the appearances and the energetic. There was actually a person in the dream group who finally I think caught up to this energetic. See, I used to talk about the energetic even though I may not have known precisely experientially the significance of it, because it is the thing that comes from inner into outer. The outer is the physical stuff and if you try to correlate or understand things based upon the appearances in the outer you’re not going to get very far. In fact, you’re never going to quite know what’s really going on. But if you’re lucky enough to recognize and just acknowledge that it all comes from inner into outer, then you’re going to be able to tell how to look at something in terms of yourself as part of it. And so if everything is an energetic then everything is light, but it’s reduced into something that we pick up from our senses and so we tend to dumb ourselves down by looking at it in co-relationship to what we perceive our wants and needs to be, outwardly. Anyway, in this dream group this one woman kind of got what I was saying. She kind of had struggled with it before and so she has the audacity to despite… to say something about me seeing and talking about things as an energetic, which meant that I was a mystic. And I blew up at her and I said, “That’s kind of a bad word,” and her head jerked. I have got to be careful how I do this because it is always a yes and a no, but now instead of her finely catching up with something and trying to let me know that she caught up with something she gets hit in the jaw, by me saying oh, that’s kind of a bad word. A mystic can’t do anything. A mystic can see things but they can’t bring it through, and I said the octave that you need to be pondering that is the feminine aspect and trait to all of this, it’s like the next other half, is the alchemist… that is able to see how the variables twine around into life. Well, obviously that was a bit of a shock to her. She got up and left. And I’ve been monitoring that watching the ethers over a course of time and I’m realizing that this was pretty, pretty hard on her. Because she struggled a lot with me enough as it is, and when she finally starts to finally figure out that she has found a space in which everything could be kind of copacetic, she gets smacked again. Then this time almost rudely. And so I had a dream that night that portrayed, not that I know how to work with this, it more or less shows that I am kind of a force of nature and I suppose I have to start trying to figure out how to take responsibility for that. But in the dream, I was looking at this carpet and that I have been vacuuming, and there’s an area of the carpet where a lot of foot traffic and I have worked extra diligently with this vacuum cleaner on this area. But what was baffling to me is that area also had scratch marks in the carpet going up and down. Now, I know this vacuum cleaner has a little bit of a problem but as far as I’m concerned it still works so I keep using it in that it rubs the carpet. Instead of just vacuuming and gliding over it nicely it kind of rubs the carpet a bit. But this is just the first time that I actually looked at the carpet and realized that something is sharp or something and hanging down and it’s cutting the threads. And that’s what happens when you take and are in a process but at the same time lose or take out a certain gentility or quality that tends to leave everything kind of soothed or okay. In other words, what she said was kind of correct. I didn’t need to act like what she said was like catching up with something that was now first grade, because now we are in high school, or something, you know that kind of rudeness to it. And I sent this off, and he actually had a pretty interesting response. 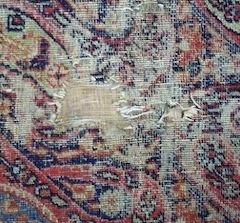 He described it as being kind of a tariqa image in which a part of something of which when you are working and vacuuming the carpet and such shows that you are part of a general overall energetic… And that when you do something to disturb the group of that energetic, you tear threads, and you do damage to the cadence and balance. Parts of ourselves all progress energetically at different rates and so I found that interesting.